What's that smell? It's nail polish... I "arted". Army veteran, cat lover, medical professional and polish fanatic! Call it a hobby, or a bad habit, I'm hooked. 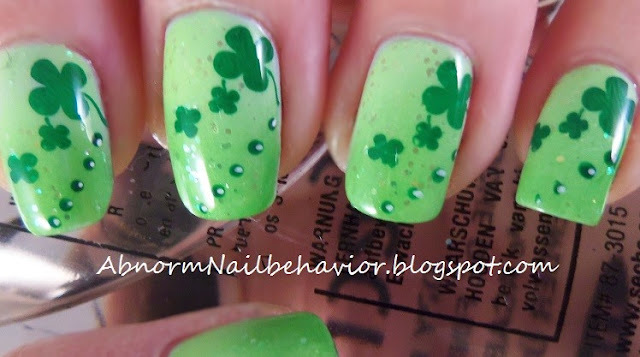 I'll show you how to do it, all the polishes, and tools I used. No secrets, just nail art. Fellow nail junkies, welcome to where I keep my shenanigans. I was looking at my polish for inspiration when I noticed some colors from China Glaze's Safari collection that I have never even opened. Then it hit me... 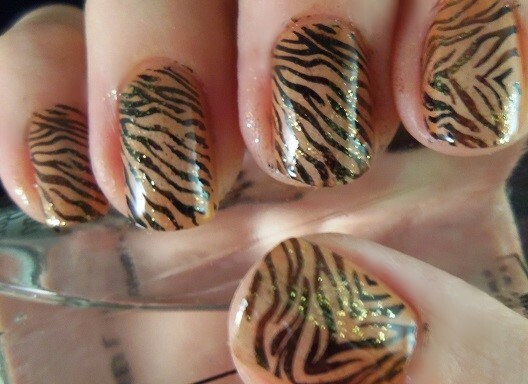 I could use my zebra nail plates to do a tiger print manicure. Ta Da! I used a couple different techniques for this design and I really like how it turned out. I wish I was a better photographer because in person the glitter really draws the eye and takes charge. I imagine that any dusty orange and tan/yellow polish would work for this. These are the colors that made me think of Tiger Print. 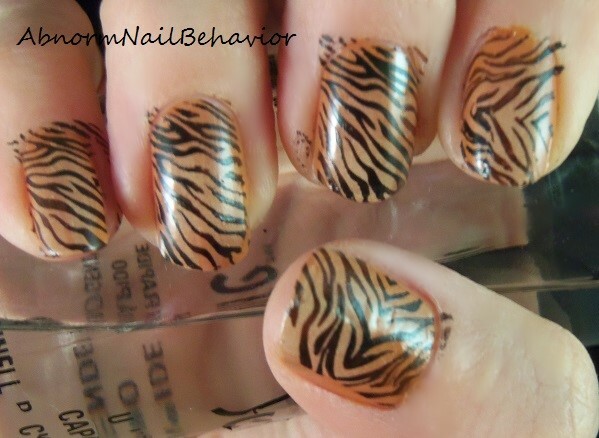 :) The fact that they came from a collection entitled Safari probably had a little something to do with it also. 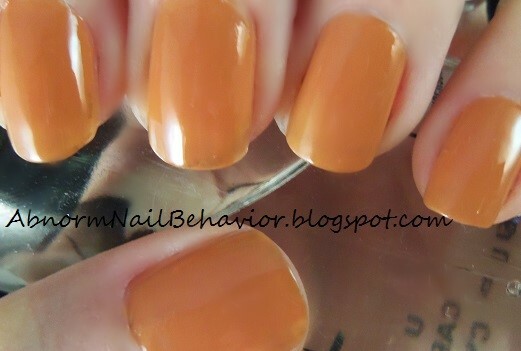 Paint your nails with the orange polish for a base. This is two coats of CG Desert Sun. Let your polish dry before you move on or the sponging in the next step will lift more paint than it puts down. 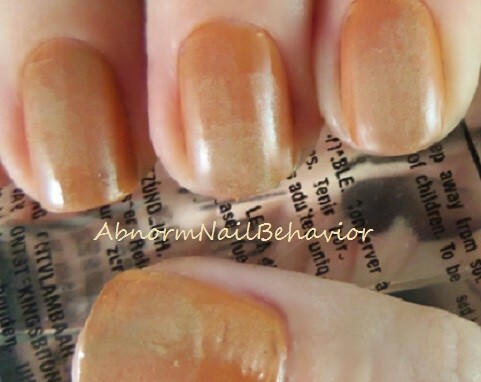 Paint some of your tan polish (this is Kalahari Kiss) onto the end of a makeup sponge and lightly dab it all over your nails. This does not have to be uniform and as you can see mine was a bit of a mess. Remember that you will be stamping over this and any minor boo-boos will be lost in the pattern. 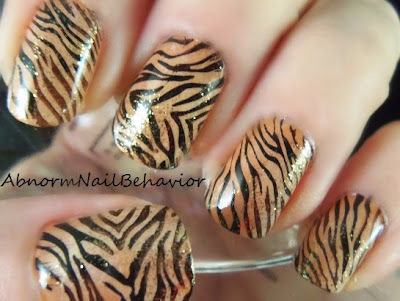 I wanted to add a little depth to the stripes in my design so I used both brown and black for my stamping. This isn't really necessary but I like feel like it adds a little something when your manicure is detailed and multidimensional. Also just a personal preference but I like to use different plates if I have similar designs. 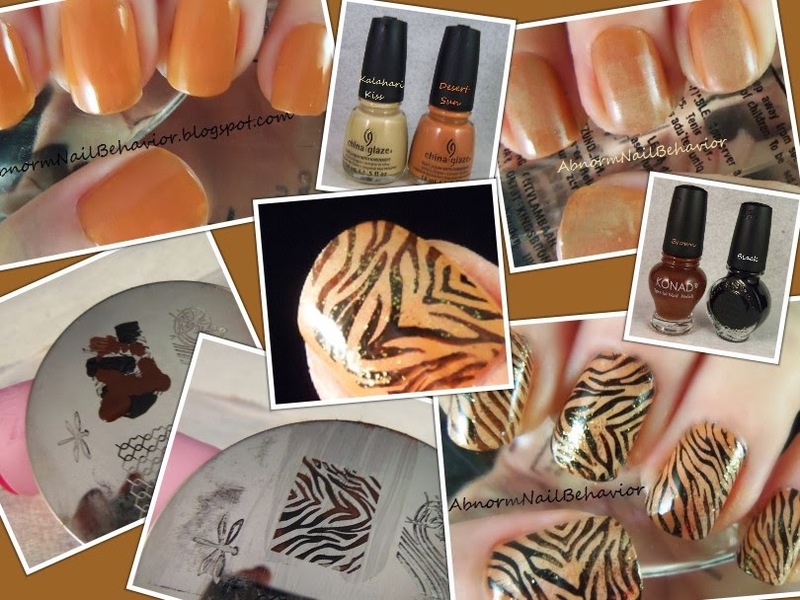 Most image plate sets include a zebra print design so mix them up to break up the monotony of having each nail exactly the same. Ready set stamp! Paint or rather glob polish onto your image plate. Now when you scrap off the excess you should have something similar to this. The colors will fill the engraved portion and blend together a bit. Stamp as usual. Work quickly as these polishes dry up pretty fast. As you can see this at this point my nails don't really look that great but I promise it gets better so hang in there. I would also like to offer this photo as proof that I do paint the nails on my right hand. I usually only photograph my left hand but for some reason this time I got the rare righty shot. As you can see I don't stamp or take great pictures left handed lol. To add a little sparkle without completely overwhelming or losing the main design sponge on glitter rather than painting it on. 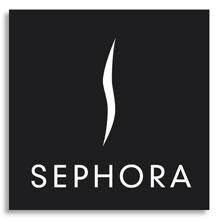 This gives you a little more control over where is goes and lets your build it up in some areas while leaving other areas barely kissed. So here is our tiger print before our final clean up and top coat. Now you just need to get the extra paint off your skin with a little polish remover and an old eyeliner brush and add your favorite clear coat. I highly recommend Seche Vite if you have not tried it. It goes on like a dream and looks like a shiny coat of glass on your nails. I get mine on Amazon but you can also find it at Sally's.